Designed for those dedicated cyclists among us who don't take a day off due to weather, the Shimano SH-MW5 Winter MTB shoe showcases smart features to keep your feet warm, dry, and comfortable. Starting with the durable synthetic layer construction, Shimano adds in their Dryshield® membrane to keep the water at bay. Inside, a insulating fleece liner keeps feet warm as the wind and rain buffet the shoe, while the fleece-lined insole adds to that insulation and heat retention. Foregoing the standard buckle, or more modern Boa closure systems, Shimano extended the shoe with a neoprene ankle collar with a hook-and-loop closure, an extended lace flap, and Shimano's speed lacing system. With the simple pull of a lace, the shoes tighten up for the secure fit Shimano's known for. Down below, a fairly stiff sole is perfect for commuting or light riding, earning a Stiffness Indicator of 5 out of 12 from Shimano. A durable rubber tread provides versatile grip that defies wet, muddy, or icy terrain so you don't end up on your backside as you walk away from your safe, uneventful commute. 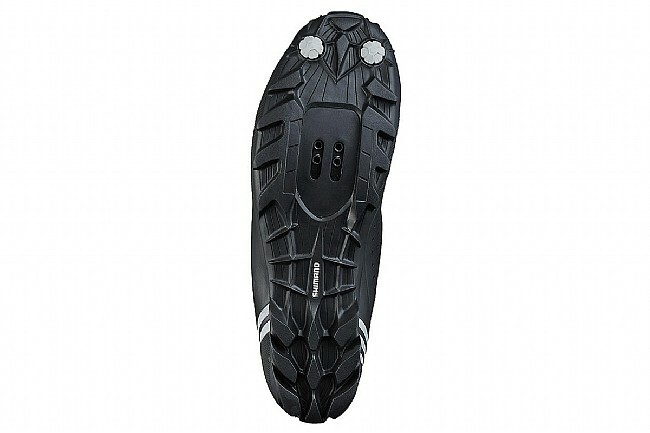 The Shimano SH-MW5 Winter MTB Shoe is compatible with 2-bolt mountain-style pedals and cleats. DRYSHIELD® waterproof membrane with fleece liner keeps feet warm and comfortable in rain, wind, cold, and mud. Insole with fleece liner for added insulation and heat retention. Lace flap and neoprene ankle collar keep out water and dirt. Speed lacing system allow fast, easy adjustments and a secure fit. Adaptable cup insole with fleece liner. Durable rubber tread offers excellent grip and traction. Stiffness Indicator: 5 of 12. Sz 48 fits american size 13 with heavy ski sock just fine. among winter shoes, it's the easiest to put on & take off. Lighter than most. Good so far to 18 degrees F in some wind and in the darkish dawn. Glad I bought 'em. EXCELLENT shoe - so glad I purchased for the Minnesota winters! These shoes and a pair of warm socks - and I was good to go in 20 degree weather. Coldest so far, I will try them out in colder temps soon! Love them. I've had these shoes for a year now. I was new to bike commuting and thought these were better than shoe covers, but my feet would still get wet. Almost a year in and these shoes hold water like a bucket, but my feet don't get too cold due to the Wet Suit effect. After an hour of riding to get to work, I am pouring about a cup of water out of each shoe. Although these Shimano shoes fit comfortable, I am not impressed at all and am looking to purchase a replacement option. I am very disappointed in these shoes. I am only a week in to using these shoes, but they are performing exactly as expected. 1. Keeps my feet dry. 2. One step process as I no longer need to put booties on over my cycling shoes. 4. On the wider side. Also works for me. 5. Neoprene inner boot that is part of the tongue needs adjusting after putting boot on. 6. Not as high as booties so an exposed gap can occur between pants and boot. I am in Vancouver so we get lots of rain and these boots are dry. The intended purpose of these boots are for commuting. I use them with Shimano M540 pedals on a Surly Disc Trucker. The only issue is the inner boot part needs to be straightened out when I put the boot on. You can't just slip them on. Very minor and the pros massively out weigh this minor issue, which may get better as the boots wear. These are great winterwet weather shoes! I bought these shoes a couple years ago and all I have to say about them is I love them. I have worn them in 5F weather, 38F and rain weather and all sorts in between - my feet have not been cold or wet! I only wear one simple pair of merino wool socks and stay toasty warm and dry every time out on my bikes. Trudging through the snow on my Fatty, Fondos in the early spring rains - these boots rock! The only negative comment I have about them is they are not the easiest to slip on and off because of the layered construction but that is worth the little hassle to keep the feet sweet! True to size and very comfortable. BTW, WBW have great pricing and great service! This shoe eliminates the need for cumbersome short-lasting shoe covers. A nice surprise from this shoe is the power gained from the rigid sole. No complaints here. 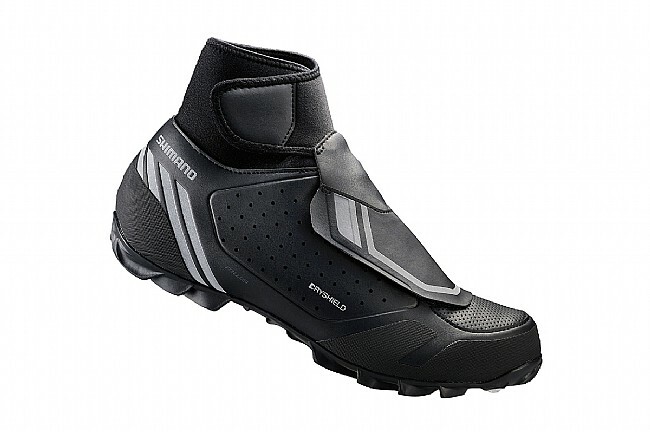 I'm a Sidi diehard so I ordered the Sidi Diablo as well as these and I'm so happy I did. These shoes are like slippers! Don't get me wrong...they have the requisite stiffness of a good road shoe (I prefer mountain bike shoes for all of my riding), but are so comfortable. I found the Sidi Diablo incredibly stiff and uncomfortable so back they went. The Shimano in a 40 fits my narrow women's 8.5 perfectly with a mid-weight wool sock. You can't go by the chart. These run large. For that matter, I could probably fit a thicker sock in just fine. The upper is very pliable and hugs the foot nicely. I do find that my toes still get a bit chilled when riding in the lower to mid 30s. A shoe cover should take care of that or possibly a toe warmer. That said, my feet do tend to run cold in general. The jury is still out relative to waterproofness. I have had wet feet after a couple rides in light rain, but I think a couple more wet rides with special attention paid to battening down the hatches on the shoes will tell me if it is the shoe or if it is user error. It appeared to be getting in through the upper at the toe area as my tights closed off the ankle, the shoe was wrapped and fastened well at he Velcro closures, and only my toes were wet. I'll provide an update once I know. I still highly recommend them for their superior comfort. These have been worth their weight in gold this winter. My feet stay dry and warm in almost everything save for the worst downpours. Ordered a 46 because I wear 46 Giro and Pearl. They fit perfect. First 2 rides temps were 20 - 30, my feet were warm with thick socks. 3rd ride was below 10 and i wore bootie over shoes, feet were warm. 4th ride was same temp but didnt wear booties, my feet were cold after 1.5 hours. So if riding at or below 10 degrees wear booties over the shoes. Also, very easy yo get on and off. Great shoes, as multiple reviews have indicated. I have been bike commuting with them and also on a few 2 hour rides. My feet are plenty warm with regular socks on 40 degree days, and with thicker wool socks on 25 degree days. For commuting, one thing that surprised me is how stable these shoes feel for walking. It's more like wearing a hiking boot, as opposed to duck walking around in a regular cycling shoe with booties. The only weakness I can foresee is that the speed lacing system plastic piece does not seem that sturdy, and sometimes the laces do not pull through easily. Overall, great shoes and I wish I had bought them years ago! I have had lake boots for years and they are great, though a little warm when it is right around freezing. They are also very heavy when pedaling. I had been eyeing lighter weight winter shoes for awhile and pulled the trigger on these when I was waiting on replacement parts for the buckles on my boots. I have been very glad I did. They keep my feet dry and I have felt plenty warm down to about 20 degrees. Spinning them around the crank axle takes a lot less out of me over the course of a long ride as well. Would definitely recommend these for commuters and anyone else who likes to ride in the cold who doesn't necessarily need coverage for subzero (fahrenheit) temperatures. These run pretty true to size, I bought them over the internet without physically trying them on first. The lace system works well, and while it may seem a little on the flimsy side, it's holding up to abuse. The ankle collar seals well and works great with the insole flap, these shoes are very secure and snug on your feet once they're all velcro'd up. There's room in these shoes comfortably for 2 thick pair of socks, even though the shoe looks narrow. They have a lot of reflective graphics on them which is always a nice touch. They are definitely much warmer than a standard mtb shoe, though if you're somewhere really cold (i'm in New England) you'll still want to wear some booties over them. They accept a cleat with no difficulty (i use eggbeaters), though the cleat well seems a little more confined than other brands at first. Price-wise they seem a little on the high side, but I am happy with them so far. As I suspect most winter riders do, I ordered the shoe 2 sizes larger than my regular shoe, so I could fit 3 pair of socks on inside the show. The first pair is a wicking layer, the 2nd layer is wool, and the 3rd layer is a neoprene sock. My foot did not get cold on a 3 hour ride at 36 degrees. Below 36 I add a booty over the shoe, and below 30 I add a chemical foot warmer. My coldest ride so far has been 20 degrees for 2 hours. My foot stayed warm. I've used these shoes in sub 20 degree weather and they are super warm (when coupled with toe warmers) - much better than neoprene shoe covers. They also seem well-made. Fit is consistent with other Shimano products. My old shoes where causing my feet to be very cold and painful. The SH-MW7 shoe fixed that problem and my feet are much more comfortable and warmer. The shoes fit accurately, not too big or too small. Went to the warehouse in Portland and tried on all the different winter shoe models BikeTireDirect had. These were the best as they are easily to put on and off. Some shoes had too many straps and gadgets. Most reviews I have seen for winter shoes recommend a size or two bigger. I would not recommend going too big in model. Normally, I use a 42 in Shimano and Specialized. I did, however, purchased a 43 in these and these is plenty of extra room. As for warmth, I have 6 mile commute in the cold Central Oregon mornings with temps between 20 to 35 F. The shoes have performed as expected, feet stay warm. Also, feet have not overheated on my ride home when temp have been in the 50s and 60s. Feet stay nice and warm for weather below freezing. Neoprene ankle cuff seems to be coming apart at the seams only after a month of use.